The AWS Toolkit for Eclipse will automatically download new releases of the AWS SDK for Java, ensuring that you always have the most recent version of the service clients and productivity libraries. Some customers with slow network connections told us that the automatic downloads were sometimes triggered when they didn’t want to wait. In response, we made a couple of small changes to make this process more predictable and easier to manage. First, we changed the directory where we download the SDKs. In previous releases of the Toolkit, the SDKs were stored in a directory specific to your eclipse workspace, so you would get a new SDK downloaded every time you started a new workspace. To eliminate this duplication, we consolidated all SDKs, for all workspaces, into one directory. It defaults to your home directory, but you can configure it to be wherever you want via a new preference page. We also added a preference setting to not automatically check for and download new releases, so that customers adversely impacted by downloading every release of the SDK can opt out of this behavior. Even if you decide to manage your SDK releases manually, you can always update to the latest version using the Check for updates now button in the preferences. 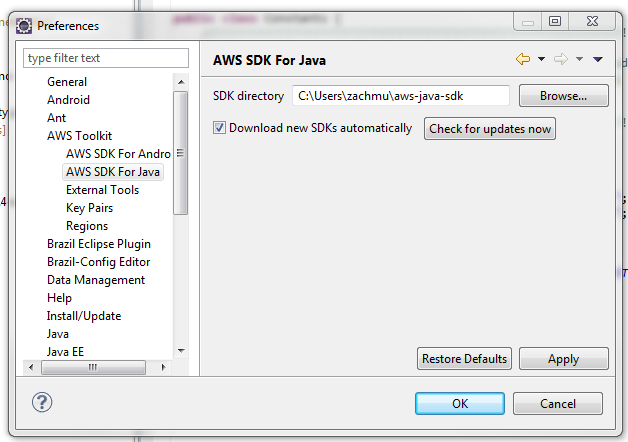 As a final note, the same preferences can be configured for the AWS SDK for Android.